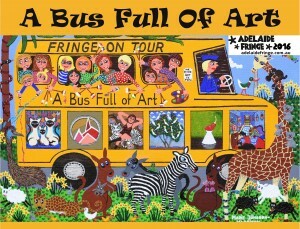 Saturday February 13th , Look for the artists in bus costumes in the Fringe Parade. Friday February 19th , Salisbury Secret Garden, Salisbury Civic City Square 6pm-8pm. Sat-Sun Feburary 20-21st, Tall Ships Festival, Port Adelaide, Lipson Street 10am-6pm. Friday Feburary 26th, Hindmarsh Square, north side 10am-7.30pm. Saturday Feburary 27th, Adelaide Parklands, Opposite Jarmers Kitchen, Bowden 4pm-8pm. Sunday Feburary 28th, Hahndorf Art Academy 10am-4pm. Friday March 4th, Fringe on Tour, Flinders University 9.30am-2pm. Saturday March 5th, Desert Fringe, Port Augusta 4pm-8pm. Tuesday March 8th, Penny Hills Winery, McLaren Vale 4pm-8pm. Saturday March 12th, Glenelg Foreshore 10am-7pm. 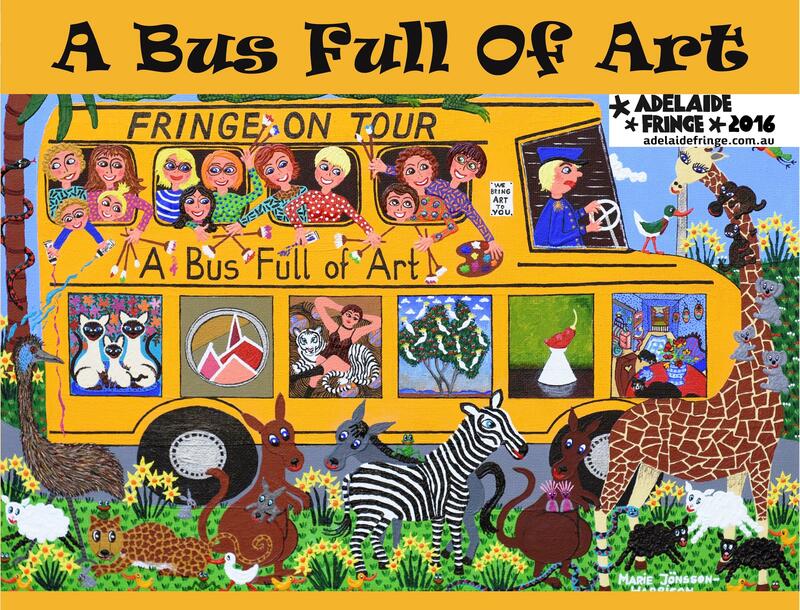 Sunday March 13th, Goolwa, Fringe on Tour, 9.30am-4.30pm. Excited to have my first exhibition in Berlin (the current art capital in Europe) at Galerie Gutman Art, 6th – 26th November 2015. Thank you my fantastic European agent Eliane Kristensen for all your hard work as always and I am very excited about all the exhibitions you have also locked in for 2016. It is going to be a very busy year! The cat’s whiskers of SALA events, is on this month of August at Woodcroft Community Centre showing until 31st August. It was openend with Arts pizazz from Russell Starke OAM. Come and view the book illustrations, paintings and sculptures by artist & our book illustrator Marie Jonsson-Harrison from the popular picture book Winston Knows by author Jan Gaebler Smith, about a snoozy cat with a nose for adventure. Author Jan Gaebler Smith and artist/illustrator Marie Jonsson-Harrison will be happy to answer any questions you have! Come to Jamestown in the Mid North of South Australia and view Marie Jonsson-Harrison’s new Public Sculpture. It is in the Main Street of Jamestown opposite the Jamestown Hotel and can be viewed day and night. The theme is ‘Step up, Boots n’ All’ with a focus on the trees of the nearby Bundaleer Forest and the Belalie Creek which is a permanent flow of water through the town. Throw in some sheep and Hereford Cows all wearing fancy boots made from heirloom china and other treasures from the people in the area. Top this off with a couple of bees supplying the area with honey and there you are! Thank you to the SA Rural Women’s Gathering Committee of Jamestown for your support of the initiative by Jenny Hall to get this sculpture made, helped by Di McCarthy, Keith & Yvonne Woidt, Anne & Paul Redden for their use of their shed and Steve Couch for your amazing work in the erecting the sculpture and landscaping. Special thanks to all the mosaic artists of Jamestown.